The Roman Pontiffs have frequently averted to the scriptural basis of devotion to the Sacred Heart of Jesus. Jesus, Who is one with the Father (cf. John 10, 30), invites His disciples to live in close communion with Him, to model their lives on Him and on His teaching. He, in turn, reveals Himself as "meek and humble of heart" (Mt. 11, 29). It can be said that, in a certain sense, devotion to the Sacred Heart of Jesus is a cultic form of the prophetic and evangelic gaze of all Christians on Him who was pierced (cf. John 19, 37; Zach. 12, 10), the gaze of all Christians on the side of Christ, transfixed by a lance, and from which flowed blood and water (cf. John 19, 34), symbols of the "wondrous Sacrament of the Church". The Gospel of St. John recounts the showing of the Lord's hands and His side to the disciples (cf. John 20, 20), and of His invitation to Thomas to put His hand into His side (cf. John 20, 27). This event has also had a notable influence on the origin and development of the Church's devotion to the Sacred Heart. These and other texts present Christ as the paschal Lamb, victorious and slain (cf. Apoc. 5, 6). They were objects of much reflection by the Fathers who unveiled their doctrinal richness. They invited the faithful to penetrate the mysteries of Christ by contemplating the wound opened in His side. Augustine writes: "Access is possible: Christ is the door. It was opened for you when His side was opened by the lance. Remember what flowed out from His side: thus, choose where you want to enter Christ. From the side of Christ as He hung dying upon the Cross there flowed out blood and water, when it was pierced by a lance. Your purification is in that water, your redemption is in that blood." Devotion to the Sacred Heart was particularly strong during the middle ages. Many renowned for the learning and holiness developed and encouraged the devotion, among them St. Bernard (+1153), St. Bonaventure (+ 1274), the mystic St. Lutgarda (+1246), St Mathilda of Marburg (+ 1282), the sainted sisters Mathilda (+ 1299) and Gertrude (+ 1302) of the monastery of Helfta, and Ludolf of Saxony (+1380). These perceived in the Sacred Heart a "refuge" in which to recover, the seat of mercy, the encounter with Him Who is the source of the Lord's infinite love, the fount from which flows the Holy Spirit, the promised land, and true Paradise. In the modern period devotion to the Sacred Heart of Jesus underwent new developments. At a time when Jansenism proclaimed the rigours of Divine justice, the devotion to the Sacred Heart of Jesus served as a useful antidote and aroused in the faithful a love for Our Lord and a trust in His infinite mercy symbolized by His Heart. St. Francis de Sales (+ 1622) adopted humility, gentleness (cf. Mt. 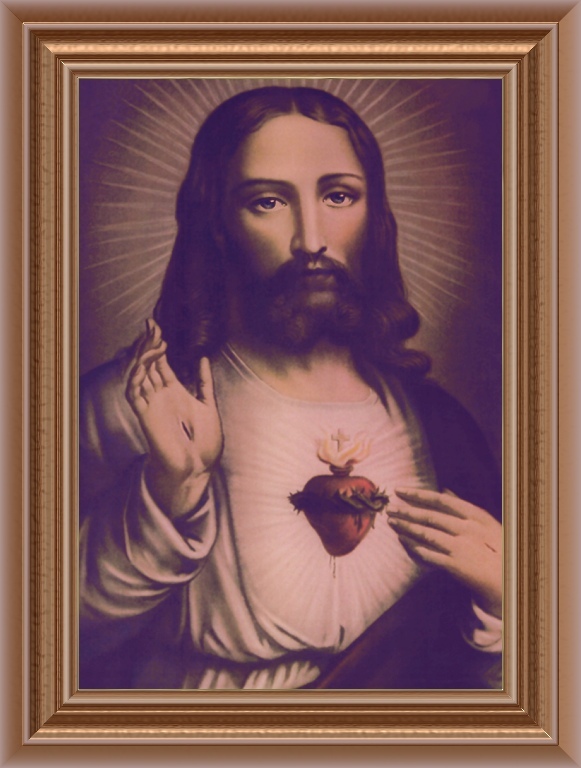 11, 29) and tender loving mercy, all aspects of the Sacred Heart, as a model for his life and apostolate. The Lord frequently manifested the abundant mercy of His Heart to St. Margaret Mary (+ 1690); St. John Eudes (+ 1680) promoted the liturgical cult of the Sacred Heart, while St. Claude de la Colombiere (+ 1682) and St. John Bosco (+ 1888) and other Saints were avid promoters of devotion to the Sacred Heart. personal consecration, described by Pius XI as "undoubtedly the principal devotional practice used in relation to the Sacred Heart." the pious practice of the first Fridays of the month which derives from the "great promises" made by Jesus to St. Margaret Mary. At a time when sacramental Communion was very rare among the faithful, the first Friday devotion contributed significantly to a renewed use of the Sacraments of Penance and of the Holy Eucharist. Among the wonderful developments of sacred teaching and piety, by which the plans of the Divine Wisdom are daily made clear to the Church, hardly any is more manifest than the triumphant progress made by the devotion of the most Sacred Heart of Jesus. Very often indeed, during the course of past ages, Fathers, Doctors, and Saints have celebrated our Redeemer's love: and they have said, that the wound opened in the side of Christ was the hidden fountain of all graces. Moreover, from the Middle Ages onward, when the faithful began to show a more tender piety towards the most sacred Humanity of the Saviour, contemplative souls became accustomed to penetrate through that wound almost to the very Heart Itself, wounded for the love of men. And from that time, this form of contemplation became so familiar to all persons of saintly life, that there was no country or religious order in which, during this period, witnesses to it were not to be found. Finally, during recent centuries, and most especially at that period when heretics, in the name of a false piety, strove to discourage Christians from receiving the most Holy Eucharist, the veneration of the most Sacred Heart began to be openly practiced, principally through the exertions of St. John Eudes, who is by no means unworthily called the founder of the liturgical worship of the Sacred Heart of Jesus and the veneration of the Sacred Heart of Mary. But in order to establish fully and entirely the worship of the most Sacred Heart of Jesus, and to spread the same throughout the whole world, God Himself chose as His instrument a most humble virgin from the order of the Visitation, St. Margaret Mary Alacaque, who even in her earliest years already had a burning love for the Sacrament of the Eucharist, and to whom Christ the Lord had very many times appeared, and was pleased to make known the riches and the desires of His Divine Heart. The most famous of these apparitions was that in which Jesus revealed Himself to her in prayer before the blessed Sacrament, showed her His most Sacred Heart, and, complaining that in return for His unbounded love, He met with nothing but outrages and ingratitude from mankind, He ordered her to concern herself with the establishment of a new feast, on the Friday after the Octave of Corpus Christi, on which His Heart should be venerated with due honour, and that the insults offered Him by sinners in the Sacrament of love should be expiated by worthy satisfaction. But there is no one who knoweth not how many and how great were the obstacles which the handmaid of God experienced, in carrying out the commands of Christ; but, endowed with strength by the Lord Himself, and actively aided by her pious spiritual directors, who exerted themselves with an almost unbelievable zeal, up to the time of her death she never ceased faithfully to carry out the duty entrusted to her by Heaven. At length, in the year 1765, the Supreme Pontiff Clement XIII approved the Mass and Office in honour of the most Sacred Heart of Jesus; and Pius IX extended the feast to the universal Church. From then on the worship of the most Sacred Heart, like an overflowing river, washing away all obstacles, hath poured itself forth over all the earth, and, at the dawn of the new century, Leo XIII, having proclaimed a jubilee, decided to dedicate the whole human race to the most Sacred Heart. This consecration was actually carried out with solemn rites in all the churches of the Catholic world, and brought about a great increase of this devotion, leading not only nations but even private families to it, who in countless numbers dedicated themselves to the Divine Heart, and submitted themselves to its royal sway. Lastly, the Sovereign Pontiff Pius XI, in order that, by its solemnity, the feast might answer more fully to the greatly widespread devotion of the Christian people, raised the feast of the most Sacred Heart of Jesus to the rite of a double of the first class, with an octave; and moreover, that the violated rights of Christ, the supreme King and most loving Lord, might be repaired, and that the sins of the nations might be bewailed, he ordered that annually, on that same feast-day, there should be recited an expiatory form of prayer in all the churches of the Christian world. Then the Jews (because it was the parasceve), that the bodies might not remain upon the cross on the sabbath day (for that was a great sabbath day), besought Pilate that their legs might be broken: and that they might be taken away. The soldiers therefore came: and they broke the legs of the first, and of the other that was crucified with Him. But after they were come to Jesus, when they saw that He was already dead, they did not break His legs. But one of the soldiers with a spear opened His side: and immediately there came out Blood and water. And he that saw it hath given testimony: and his testimony is true. And he knoweth that he saith true: that you also may believe. For these things were done that the scripture might be fulfilled: You shall not break a bone of Him. And again another scripture saith: They shall look on Him Whom they pierced. In order that the Church might be taken out of the side of Christ, in His deep sleep on the Cross, and that the Scripture might be fulfilled which saith: They shall look on Him Whom they pierced: it was Divinely ordained that one of the soldiers should pierce His sacred side with a spear, and open it. Then forthwith there came flowing out Blood and water, which was the price of our salvation, pouring forth from its mountain-source, in sooth, from the secret places of His Heart, to give power to the Sacraments of the Church, to bestow the life of grace, and to be as a saving drink of living waters, flowing up to life eternal for those who were already quickened in Christ. Arise, then, O soul beloved of Christ. Cease not thy vigilance, place there thy lips, and drink the waters from the fount of salvation. Because we are now come to the sweet Heart of Jesus, and because it is good for us to be here, let us not too soon turn away therefrom. O how good and joyful a thing it is to dwell in this Heart. What a good treasure, what a precious pearl, is Thy Heart, O most excellent Jesus, Which we have found hidden in the pit which hath been dug in this field, namely, in Thy Body. Who would cast away such a pearl? Nay, rather, for this same I would give all my pearls. I will sell all my thoughts and affections, and buy the same for myself, turning all my thoughts to the Heart of the good Jesus, and without fail it will support me. Therefore, O most sweet Jesus, finding this Heart that is Thine and mine, I will pray to thee, my God: admit my prayers into the shrine of hearkening: and draw me even more altogether into Thy Heart. For to this end was Thy side pierced, that an entry might be open unto us. To this end was Thy Heart wounded, that in it we might be able to dwell secure from alarms from without. And it was wounded none the less on this account that, because of the visible wound. we may perceive the wound of love which is invisible. How could this fire of love better shine forth than for Him to permit that not only his Body, but that even His Heart, should be wounded with the spear? Who would not love that Heart so wounded? Who would not, in return, love one Who is so loving? Who would not embrace one so chaste? Wherefore let us who are in the flesh love in return, as much as we can, Him Who so loveth, embrace our wounded one, Whose hands and feet, side and Heart, have been pierced by wicked husbandmen; and let us pray that He may deign to bind our hearts, still hard and impenitent, with the chain of His love, and wound them with the dart thereof.